Casa Mañana at 800 Virginia Street is perfectly situated for the guest who wants to enjoy Key West at its finest. Located just three blocks from Duval Street, home of world famous watering holes, shopping, and dining, this Old Town jewel is just steps away from Fausto’s Food Palace, Sandy’s Café, and across the street from Saint Mary’s of the Sea Grotto and Church. Casa Mañana Key West is a historic conch cottage with delightful amenities. Two Bedroom, Two Full Bathes, Central Air, Brazilian Hardwood floors, Dade County pine walls, one floor living (no stairs! ), high ceilings, and the only porch detail of its kind. This house offers extensive outdoor as well as indoor living space. The front porch is a window on the world of Key West. The private deck off the kitchen allows for cozy outdoor dining and grilling as well as a secluded seating area off the master bedroom. The pool area offers generous opportunities soak up the sun. The living room has a queen sleeper sofa for visiting guests or family, CATV, WIFI, and large screen TV. The kitchen is outfitted for the gourmet chef with granite countertops, blender, dishwasher, stove, microwave, refrigerator with ice-maker, and everything necessary to prepare meals or heat leftovers during your extended vacation here. Yes, there is a blender. The master bedroom offers a king size bed, huge walk-in closet, TV, and a granite and marble bath with rain showerhead, double vanity, and private water closet. The guestroom has it’s own private entrance, closet, queen-size bed, TV, and French doors opening onto the pool. The guest bath features an art glass window, tub and shower, plus a washer & dryer combo. 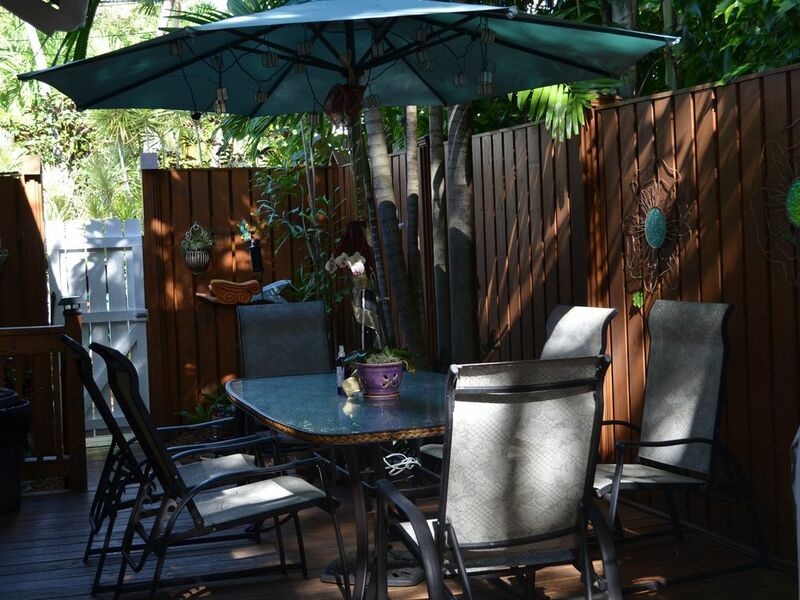 The gated and fenced yard is a lush tropical garden landscaped with plants of paradise. Hi Speed wireless Internet allows you to keep in contact with the world you left behind either poolside, deck side, or from the privacy of your bedroom. Amenities: Pool, Two full baths, Hi Speed Wireless Internet, Telephone with Answering Machine, A/C, Ceiling Fans, Iron and Ironing board, Washer/Dryer, Gas BBQ grill, CATV, DVD Player, all linens and beach towels provided. Housekeeping provided upon request. Restrictions: Sorry no pets allowed. Smoking only permitted outside. You have been excellent guests and we look forward to seeing you both in 2019. We have been going to Casa Manana for the past 6 years and are going back again next year. Lovely house, great location we couldn't do any better for the price. Highly recommend it. Thanks Isabella see you next week. You are great Marilyn, Glad you had a good stay. Thanks for telling me about the car. Our 5th year coming to Casa Mañana and already booked for next year. The true meaning of paradise! The improvements made this year (hardwood floors and central air conditioning) enhanced the experience. We love it. Great to here Isabella, we look forward to seeing you next year. We have been going to that same house for the last 4 years for a month and this year and next we decided to go for 2 we enjoy it so much. It is the perfect location close enough to the action but a very quiet neighbourhood. We will keep going for as long as we can. I would definitely recommend the house. Julia at the Management company is super efficient and fast in getting whatever needs fixing. Thank you Isabella, We will see you next year and Casa Manana will have central AC and new floors !! We have been coming for the past 3 years and we came twice this year. The house is very functional, sleeps easy 6 people has plenty of outdoors sitting and the pool is great. Some renovations is needed especially the carpets in the bedrooms but beside that it is fine. The location cannot be beat close enough to Duval but yet far enough to still be quiet. I would totally recommend this house and I can't wait to be back there next year. In the Heart of the Historic Old Town Area of Key West.